Following on from yesterday’s piece, Phillip Mccluskey from Camloc Motion Control continues to outline how gas springs should be specified. There are two differing mounting orientations available to the designer, these are ‘Push Up’ and ‘Flip Over’ mountings. In both cases, the spring should always be mounted ‘rod down’ when in the fully closed position to ensure proper lubrication of the seal package. As a general rule, Camloc’s preferred mounting is the ‘Push Up’ design orientation, as in Figure 1. This type of mounting can be identified by the fact that the end at the lowest point of the gas spring when closed, remains in its lowest position when fully open. It can also be identified by the moving mounting point being located closer to the hinge than the fixed mounting point. Unless a means is utilised to lubricate the rod, then the spring should always be mounted rod down to ensure proper lubrication of the main seal. 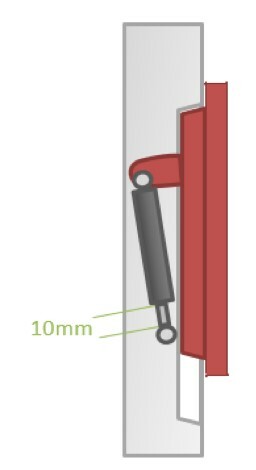 The main drawback of this mounting position is the additional strength required in the application being lifted, particularly the hinge; this is due to increased cantilever of the lid from the gas spring support. The major advantage with this type of mounting and rod down orientation is that it provides consistent damping at the end of the stroke. This is due to oil always being at the bottom of the tube, so damping will always occur at the same point in the lift cycle. 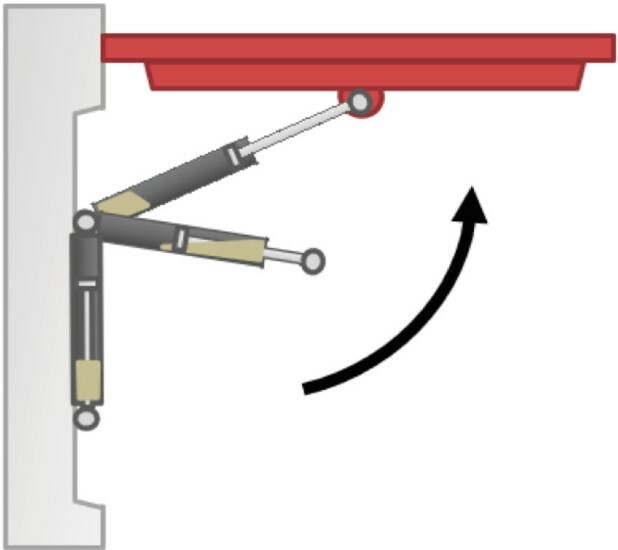 This type of mounting can be identified by the end at the lowest point of the gas spring when closed rotates to the highest point when fully open. It can also be identified by the moving mounting point being located further away from the hinge than the fixed mounting point. Unless a means is utilised to lubricate the rod then the spring should always be mounted rod down to ensure proper lubrication of the main seal in the closed position. The main drawback of this mounting position is the lack of damping control throughout the stroke. At the start of the stroke, the oil is at the bottom around the main seal. 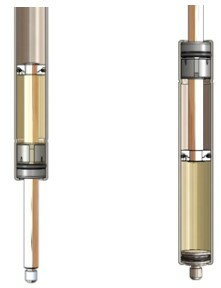 As the spring passes the horizontal position the oil begins to run down the tube towards the tube end. Along this point it will meet the piston moving up through the tube. When the piston meets the oil, the extension of the spring will be slowed until the oil has passed through. At this point, the extension speed will increase and will reach the end of the stroke with no damping. The advantage of this design is that it places less strain on the hinges than the push up design. Crossover is the point at which the gas spring takes over the lifting action (or gravity takes over to close). This will normally be around 10° to 30° from fully closed. 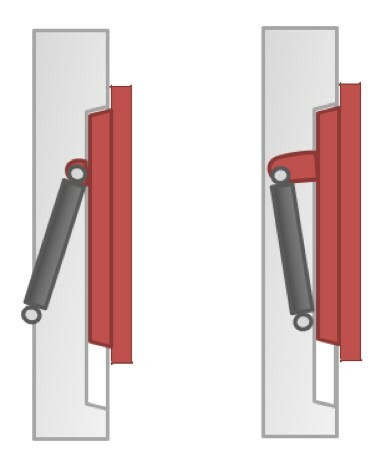 In practice, this will vary by several degrees between opening and closing, due to factors such as friction of the internal components of the spring, hinges and end connectors. Self-rise is the angle at which the gas spring will lift the lid without any assistance from the operator. Similarly, self-close is the angle at which the lid will close without any assistance. In most cases, it is undesirable to have the lid open without any operator input (referred to as ‘instant lift’). This behaviour is unpredictable to the operator and can allow the lid to open without any warning, in instances where the P1 force increases above nominal due to elevated ambient temperatures, for example. As discussed in Technical Guide – Edition 1: Gas Spring Overview, temperature not only affects the output force of the gas spring, but also the handling forces. The graphs show how a spring behaves on an application at 20°C and then again at 65°C. 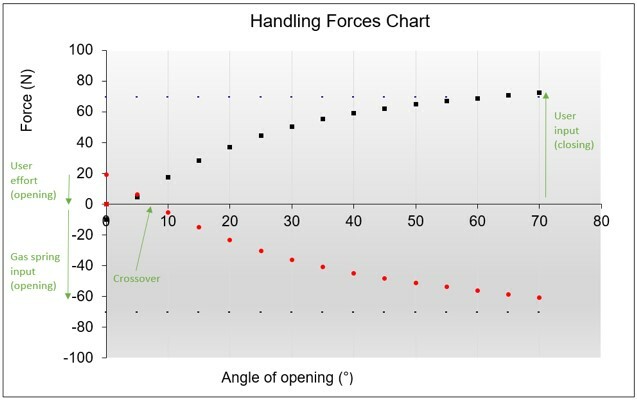 As is seen in figure four, at 20°C crossover occurs at an opening angle of around 7°, with the handling forces being acceptable in both opening and closing. For these reasons it is important that understanding of what the ambient and normal operating temperatures of an application will be, so if necessary, a suitable compromise can be made in handling performance. 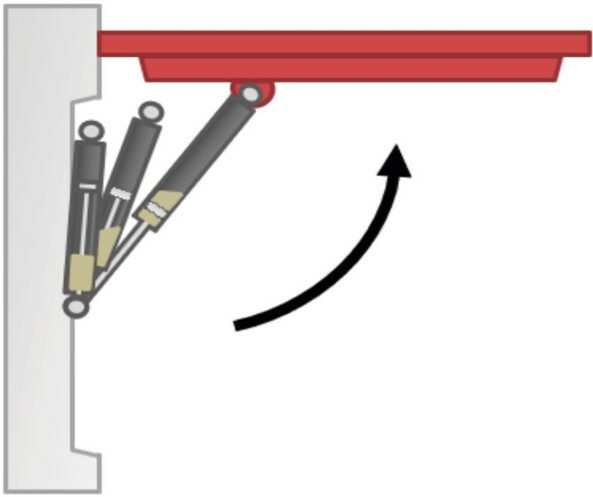 When positioning a gas spring, Camloc’s preference is to allow 10mm of unused stroke. The reason for this is to allow for the stack up of manufacturing tolerances in the application, preventing the gas spring from bottoming out before the lid is fully closed. Positioning the moving mounting point so that it creates an over-centre condition when the lid is closed will aid in reducing instant opening of the lid. Figure seven highlights two examples; one of a spring position which will lead to instant lift (on the left) and one which is over-centre and will reduce the potential of instant lift (on the right). - Move the mounting point Y1 closer towards the pivot by reducing the stroke. 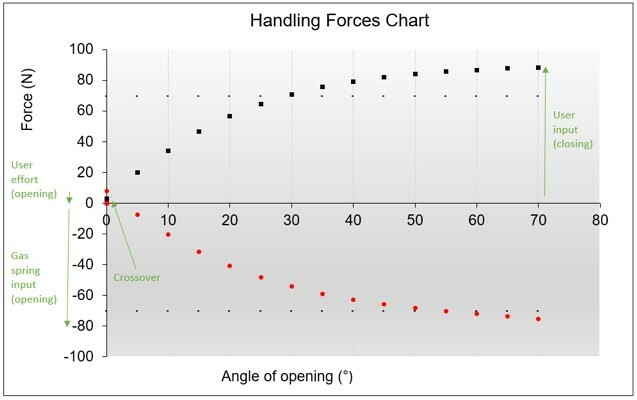 - Consider whether the opening angle could be reduced. - Move fixed mounting point Y2 to a more suitable location. Should dampers be mounted rod up or rod down? The answer to this is dependent on whether the damper is a compression or extension damper; each having specific orientations and should be mounted as in Figure 9. Extension dampers should be mounted ‘rod down’ to ensure consistent damping throughout the stroke. Mounting the damper ‘rod up’ will result in little or no damping. Compression dampers should be mounted ‘rod up’ to ensure consistent damping throughout the stroke. 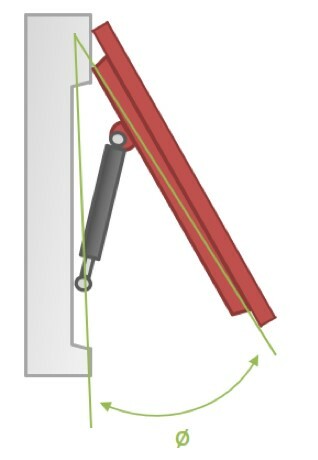 Mounting the damper ‘rod down’ will result in little to no damping. Lubrication of the main seal is not a problem due to the high volume of oil used in the damper. By following these guidelines struts can be designed to offer a predictable opening and closing rate.